How does a red dot sight work? What makes a red dot sight different from a riflescope? What are the major differences? These are some common questions posed by shooters are unfamiliar with the concept of a red dot sight. First, let’s review how a typical riflescope works. In the simplest explanation possible, several lenses combine to magnify an object in the distance and present it to the eye in perfect focus. However, two factors determine where the shooter’s eye must appear behind the ocular (rear) lens of the scope. The first factor to consider is eye relief. Eye relief is simply the distance measured (commonly in millimeters) from the outer surface of the ocular lens to the optimal position of the shooter’s eye. The shooter will know whether or not they are in the area of optimal eye relief by a large black circle around the picture seen in the scope. Generally, the higher the magnification of a given scope, the shorter the eye relief. The second factor to consider is exit pupil. Exit pupil is the width of the available light coming through the scope at the exact point of optimal eye relief. If the eye relief of a particular scope is 15mm and the exit pupil is 4mm, that means that there is a circle of light 4mm wide at exactly 15mm from the surface of the ocular lens; this is where the shooter’s eye should be. A shooter will know when they are moving outside of the exit pupil if they see a crescent of black at either edge of the picture coming through the scope. Generally, if the shooter’s eye is anywhere outside the area of optimal eye relief or exit pupil when the trigger is pulled, the shot will be off by a large margin. Red dot sights differ from traditional rifle scopes in that eye relief and exit pupil simply do not matter. Red dot sights are a type of non-magnifying reflector scope. When a shooter looks through a red dot sight, an LED diode paints an illuminated dot on what would normally be the objective lens of a typical magnifying scope. This has several advantages. First of all, all this talk about exit pupil and eye relief doesn’t apply because the image is not magnified. Second, when using a red dot sight, the shooter can keep both eyes open for a more natural aiming process, quick target acquisition, and greater accuracy. When the trigger is pulled, the shot will land wherever that dot is pointing, regardless of the shooter’s eye position in relation to the scope. Miliary tests have proven that marksmen shoot faster and more accurately with a single red dot reticle in a non-magnifying scope. Which brings us to another important point. Red dot sights are electronic, so they do require power to operate. The battery life of a red dot sight is dependent on both the power consumption of the red dot LED and the capacity of the battery. Depending on the type of battery used, most red dot sights can be expected to last several thousand hours on a single set of batteries. And since red dot sights require power to operate, factors such as waterproofing and other aspects of reliability need to be considered. 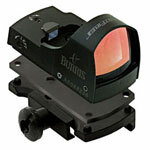 Scopelist.com carries several different makes and models of red dot sight. Choose with confidence, and know that we carry only the most rugged and reliable red dot sights available on the market.